Grades PreK through 3 enjoyed a wonderful reading this week by Mrs. Christine Banker the author of We All Have a God Light. 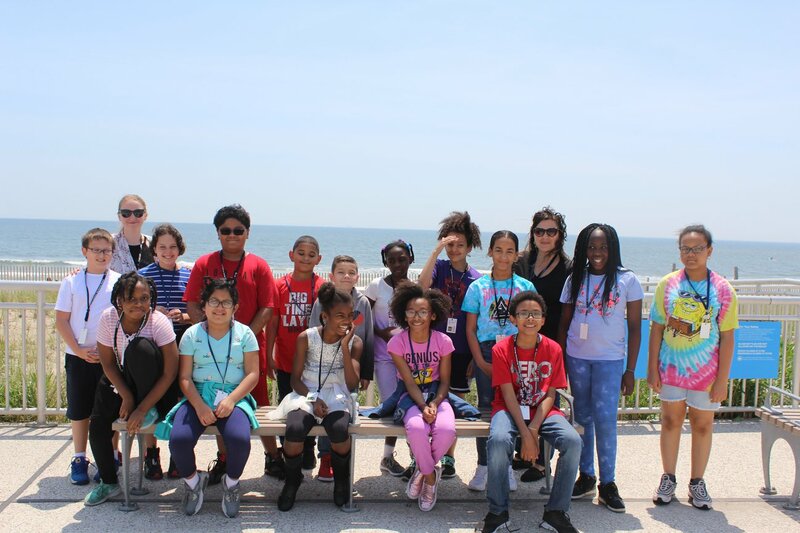 The annual Bike Skate Walk a Thon was a beautiful day with many of the classes enjoying their time on the Boardwalk. 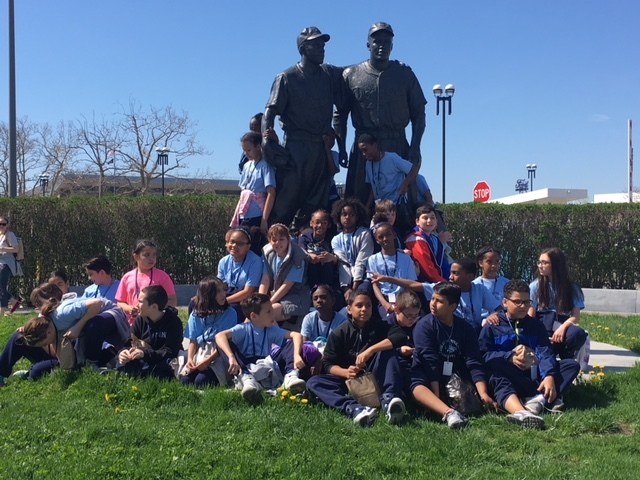 A beautiful day at MCU Park running the bases, touring the facility, visiting the boardwalk and catching the afternoon sun! School will be closed Wednesday, March 21st due to the snow storm. Welcome to Catholic Schools Week with our very own St. Rose of Lima. 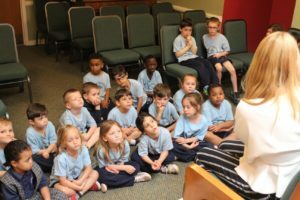 There are many exciting events that have taken place or will be taking place this week: Opening Mass and Open Houses, Buddy Day, Blue/Gold Competition, Wacky Wednesday, 8th Grade Ring Ceremony….stay tuned for details. 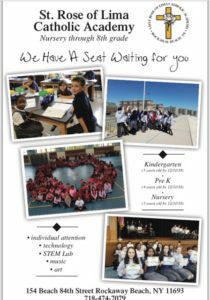 Financial assistance for 2018-2019 is now available at http://www.futuresineducation.org – Futures in Education. Come One – Come all – We are waiting for you! Ellen Sautner I do not own in Arverne by the Sea. Yet I own in the neighborhood. 3 of my 4 children attended St. Rose of Lima. 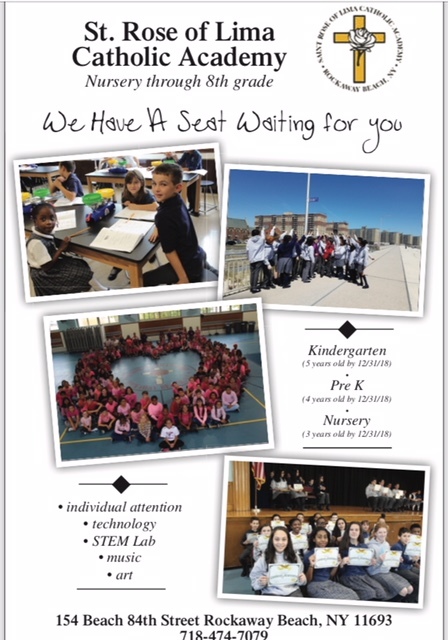 You will not find a better Catholic school in Rockaway Beach! The diversity is beautiful, the culture warm and caring, the zero tolerancepolicy for bullying or disrespect (which is tolerated in many local schools) always made me feel my children were safe. If a situation does arise, it is addressed. The education is wonderful…. needs of all children from academic excellence to the struggling learner are all met!! 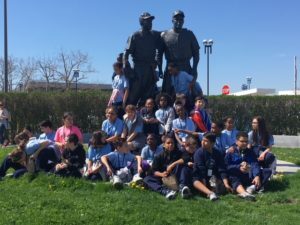 So much of what has been lost in schools, teaching respect and caring for others goes on at St. Rose of Lima. No enabling entitlement going on there!! Wonderful choice!! In this day and age we need more schools like St. Rose!! Jolynn Rivera-Simmons I did not send my kids but have family who did.. it’s a great school!! Patricia Harvey I was a part of that school for 19 years they are simply the best, my kids still stay in touch. 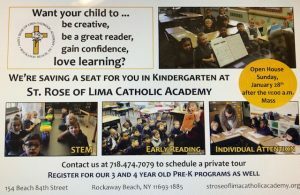 Patricia McCarthy Daly I am a graduate of St. Rose of Lima and have been very involved in the Academy for decades and you can contact Principal Theresa Andersen directly for a tour and she would be happy to provide you with all they offer. Her # is 718-474-7079. Tiffany Dawson Myy pastor and his wife have 4 of their children in st rose. They love it. Laura Gallagher it is 440 a month and you have the option of after school which is 20.00 a day. You pay as you go for the afterschool. They also have early drop off at 7:15 am and they provide free breakfast. The school day is until 3 pm and half a days are until noon. I love St. Rose. I agree with everything that Ellen Sautner says. 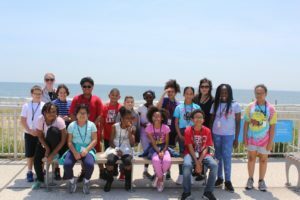 Christian Pereda The best school in the Rockaway Beach Peninsula. My son currently attends St. Rose of Lima Catholic Academy and I wish the school offers High School / up to 12th Grade. Dylan Mancini St. Rose is a great school. Patricia J. Mccabe My son went there from pre-K through 8 you will never find a better school. They turn kids into compassionate, responsible adults!!!!! Eileen Latoni St Rose is an amazing school . My 2 brothers , my sister and myself graduated from there in the late 90’s . My daughter graduated in 2014 , she went from prek to 8th grade and my son is currently in the 6th grade and has been there since pre-k . The school is amazing . Tuition is reasonable . They have an after school program which runs Monday through Friday until 6pm .Absolutely no tolerance for bullying . I would call the school and speak to Ms. Andersen and ask to tour the school . You will not be disappointed! Maureen Blute-kraus I graduated but i forget what yr! My son graduated in 2012 and my daughter graduates in june. The school is excellent. Im sorry to hear that the promise to build a primary school in ABTS was broken. Victor M Rivera Pretty much what everyone says except for one OUTSTANDING,i have 3 kids that graduated from ST.Rose. 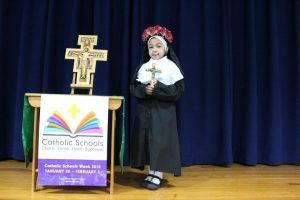 St Rose of Lima Catholic Academy will be closed Thursday, January 4th and Friday, January 5th due to the snow storm. Stay warm and be safe.